For those who want to know how to run a football Twitter account, they can’t do much better than looking at @ThistleTweet, the official twitter account of Partick Thistle Football Club. 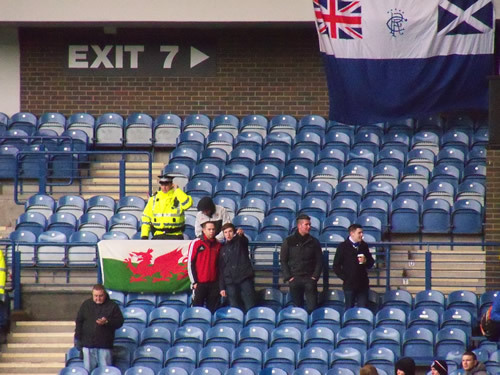 Well aware that a fair few Welsh fans would be staying in Glasgow for 24 hours after the game, they began hopping on the hashtag for #WalesAway, asking them not to be impressed by the bright lights of Rangers, but instead to head to Firhill, to see them play. It wasn’t just hopping on the hashtag, but they were also incredibly helpful, managing to shave a bit of time to lost Welshmen who didn’t know how to head to the ground. A warm welcome was promised, but I was overwhelmed by how warm it was. I nearly didn’t make it to see The Jags, as the Ibrox ground staff and police both a) didn’t know where Govan Subway stop was and b) were directing me to the incredibly busy Ibrox tube stop. After taking their advice and ignoring it, I loaded up Google Maps to head to Govan – and arrived in St. George’s Cross, eventually arriving at Firhill about 20 minutes before kick off. After a swift pint and a chat with the locals, I took my seat in the home end. 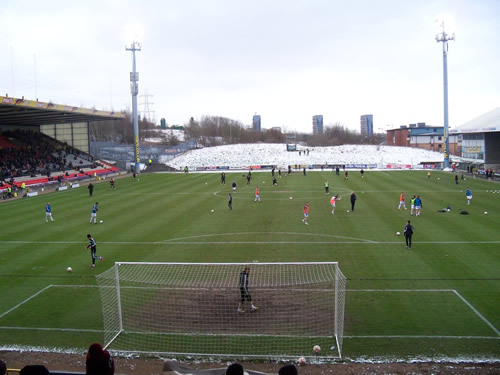 My first though on Firhill was the amount of work needed to get the ground upto grading if they ever played in the Blue Square North – behind one of the goals was open area – but the atmosphere was great. Lots of songs sung by the Jags faithful, but would the team repay the favour against Livingston, a team who were third in the league going into the game? Much of the early stick was given to the Livingston keeper – Andy McNeil – who had the world’s most ridiculous bobble haircut. The kind of haircut you probably couldn’t get away with in a surburban Glasgow, and he didn’t. Partick Thistle took the lead in the 19th minute when Arron Muirhead thumped away a penalty after Paul Watson handled in the area. 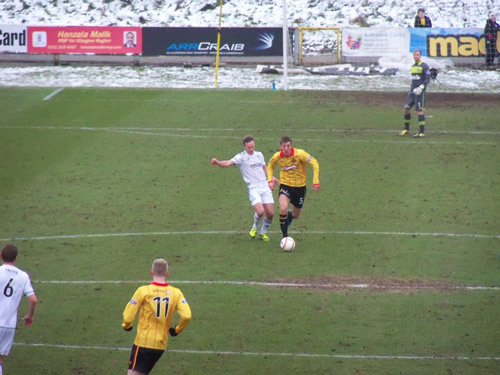 Steven Craig then doubled the hosts lead after he headed in at the far post from a Sean Welsh cross. The Welsh in Firhill obviously began to have an effect. The atmosphere in the home end was electric, and even the Welsh fans began to learn a few songs. We weren’t the only travellers though – a fair few fans arrived from Amsterdam looking at a flag, and somebody was watching the game from New Zealand. New Zealand! Our efforts seem tame in comparison. McNeil was to blame for the third goal when James Craigen’s strike bobbled over the keeper in humourous fashion, and Steven Lawless added another goal before half time when he found himself in acres of space in the area. Half time whistle blew, and Partick Thistle were 4-0 up, with Greenock Morton 2-0 down at Cowdenbeath, a chant of “We are top of the league” broke out, which – as a Colwyn Bay fan – I never thought I’d head myself sing in 2013. The second half began a little nervy for The Jags, and Livingston got a consolation goal, with Paul Watson scoring from close range, and threatened to get a foothold into the game. These threats were dashed by in my view the man of the match Chris Erskine, who broke past three defenders, and played a one two before cooly slotting in from close range. Kris Doolan then scored an equally good goal when Arron Muirhead’s long range pass found him in the area, and he cooly volley into the back of the net. Partick Thistle fans then began a change of “Welsh fans, geez a song”, which was duely obliged, and the fans attention turned to keeping warm and making new friends. There was talk of running a bus from Cardiff to Partick Thistle every week now, if that was how they performed with Welsh fans. Overall though, a warm welcome was an understatement. 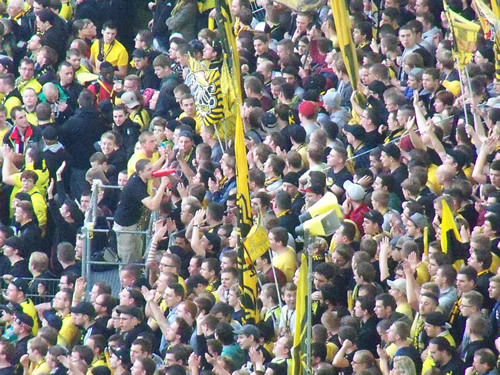 The Jags’ fans are credit to their club, and they were friendly and warm and welcoming. A top club, and I’ve now adopted them as my Scottish team. So much so that I will attempt to watch the game against Queen’s Park in the Ramsden’s Cup Final. So yes, it was a very successful trip, and Glasgow was wonderful. I’ve become a Partick Thistle fan, not only for the warm welcome, but their passing on of their knowledge. So the second game in the “Three Games in 24 hours” many Welsh fans were undertaking was one that in the time of the draw many people would not have expected to occur. You see, much has been written about Glasgow Rangers’ problems in the last few years and there relegation from the top flight of Scottish football to the bottom tier, but it’s also worth remembering that – when there is international duty – many of the top leagues in countries pause their programme for a period of time due to lack of players. 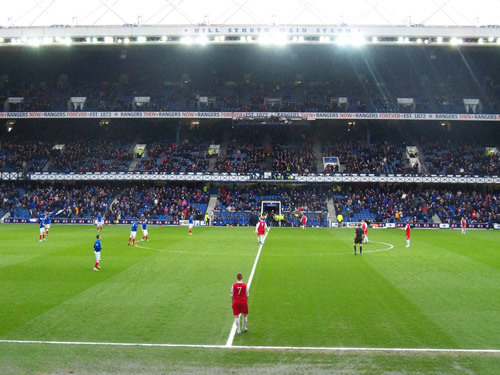 Scotland only pauses it’s top tier, but Rangers’ match does go ahead, and we were lucky enough to be in Glasgow for Stirling Albion’s trip to Ibrox. The game was an earily kick off, and the home side were heavy favourites going into the match, largely due to the fact that they could’ve won the title at the game, but Stirling had a good record against Rangers. 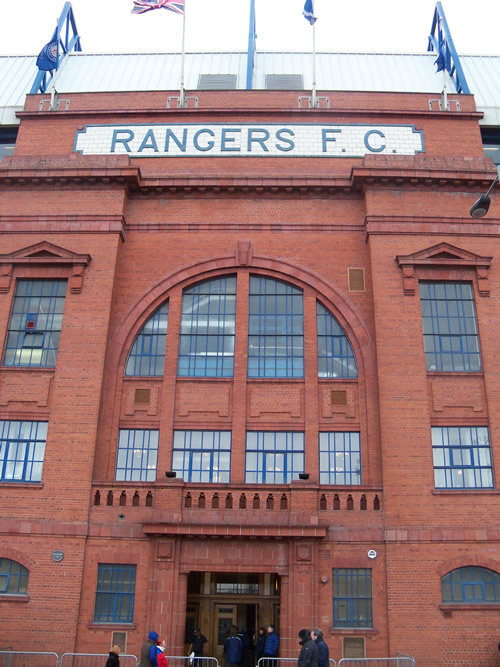 In any rate, I arrived at Ibrox about an hour or so before kick off. It was busy, but not uncomfortable. Walking to the ground this didn’t feel like a Scottish Division 3 clash, as there was people everywhere. After looking around unsuccessfully for a badge (note to football clubs. I hate pink crests, it just looks so patronising. “I’m a girl and must like pink!”. Please.) I headed into the ground and took my seat. I had great seats just on the half way line for the princely sum of £17, and about 10 or 15 rows from the front. The game had a huge build up (even though it transpired that they couldn’t win the league at the game as Queen’s Park game against Annan was called off), with marching bands, bagpipes and a fairly friendly, if a little bit sterile atmosphere. There was two other places I’d have preferred to sit though – above the Rangers’ die hard fans in one corner (who humourously unveiled a “Less time tweeting, more time training” banner as being 22 points clear of 2nd place isn’t good enough in some fans eyes), or with the Stirling Albion lot, who seemed to acquire a few Welshies as well. The game kicked off, and Rangers pressed hard for an early goal. Lee Wallace getting The Gers’ best chance early, forcing a save, but with all their possession and territory, Rangers didn’t look like scoring. In fact it was Stirling Albion who began to press towards the end of the half, with Jordan White heading goalwards that was only denied by an off the line clearance, and Scott Davidson shooting over from a one on one situation. Half time came and Rangers were booed off the pitch. I went and got a pie from the concession stands and went for a Scotch Pie. Say what you want about the blue half of the Old Firm, but the Scotch pies were absolutely top notch. No complaints from me. The second half began like the first half began, with Rangers pressing, but after an hour and more frustration, Stirling Albion once again began to find their footing, much to the delight of the travelling contingent, who were beginning to find their voice. 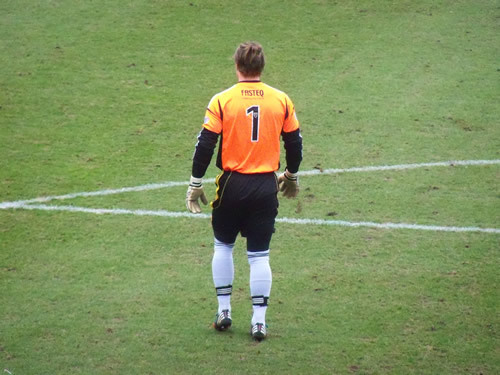 Rangers had few chances in the second half, and nearly conceded an own goal. After 0-0 after 85 minutes, I did something I never do. 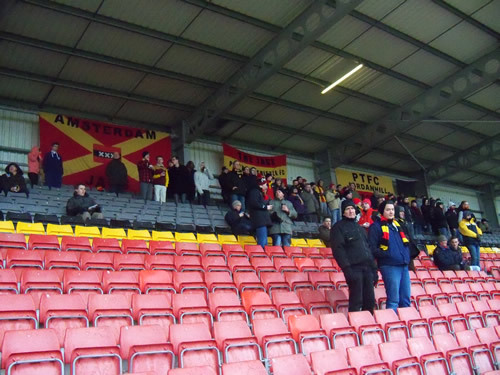 In truth, I was more excited to head to the final game in my 24 hours of football – Partick Thistle vs Livingston. Ibrox was good, I’m glad I went, I just felt I was a curse for what happened on the pitch. Nevertheless, I had a pound on a 0-0 draw at 25/1, so that paid for the trip to Ibrox. On my trip around Europe last year, I used a variety of transportation to get around, the worst was a random Thursday – with a train from Zagreb in Croatia to Budapest in Hungary, which was seven hours long. The train was long and relatively painful, stopping at a bazillion stops as soon as we crossed the Hungarian border, in one of those classic trains last seen in TV adaptations of Agatha Cristie novels. I can see why a lot of people died on these trains, not because they were brutally murdered, it was because they were dying of heat exhaustion. Sharing my cab with two old guys and 3 other young nubile Hungarian girls (which – unfortunately – didn’t speak a word of English), meant that 7 hours from Zagreb to Hungary were tough. I wish I flew. The reason to go to Hungary? Not only because I wanted to explore one of the most beautiful cities in Central Europe, but on top of that I was meeting Danny Last of European Football Weekends, to experience why grown men from all over Europe meet up in a random part of the world to watch a game of football where they have no emotional investment. The game was Debrecen vs PSV in the Europa league. Despite being the Europa League, tickets were stupidly reasonable and available on the door, of 3000 Hungarian Florints (less than £5). I arrived in Budapest at around 5pm, 3 hours before kickoff. Still in those three hours I had to avoid the scammers at the station, find the hostel, check in, find the stadium, get tickets, get some food & optinonally – get pissed. Luckily I managed most of this (bar the getting pissed) within two hours. Unfortunately, I also pined for the warmth of the stuffy Hurcule Poirot train & the three hot girls from earlier that day, with temperatures on the ridiulously low side of Baltic. Also, Hungarian football is gleefully undercommercialised, with only a small selection of scarves for sale. Unfortuantely, they haven’t learnt the ability to serve hot food & drink, with a sugary pretzels, coca cola, popcorn & seeds. Yes, seeds. It’s like if Gillian McKeith did football food. 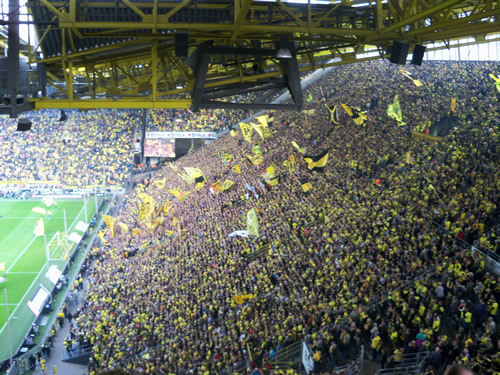 Inside the stadium there was a similar choice, but to be honest, we didn’t care. After taking my seat in the cheap seats behind the goal, with zero protection from the elements. We were greeted to a fabulous open top stadium, the kind familiar with those old enough to remember the Communist Olympics in the 70’s & 80’s. 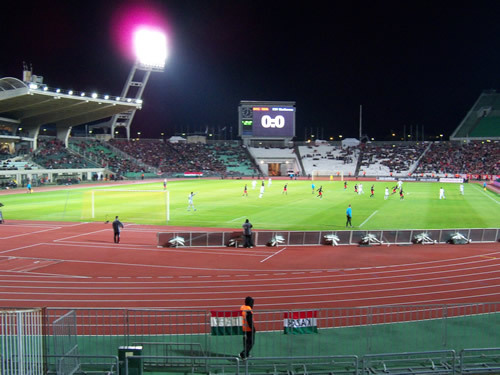 The Puskas Ferenc Stadium is a wonderful old multi purpose stadium, with colluseum like seating, an old scoreboard (which works fantastically), a minimum corporate area, a needless athletics track, and girraffe esque floodlights. Unfortunately, they couldn’t fill it with mad Debrecen fans, but as well as the European Football Weekends lot (who also occupied the cheap seats behind the goal), the PSV fans (occupied to our left, and it was reported that they coached from Eindhoven, which I found the day after to not be the case), and the Debrecen fans in a sweeping wave to the right of us culminating in a manic support opposite us – what they lacked in numbers (18000 being the official attendance, doubt it to be completely honest), they made up with fine voice. The non existant roof came off half way through the first half, when Mijadinoski – after a period of Debrecen pressure – nodded the home team in the lead. The crowd erupted, before returning to the glorious state of noise. The coach tripping PSV fans couldn’t compete. 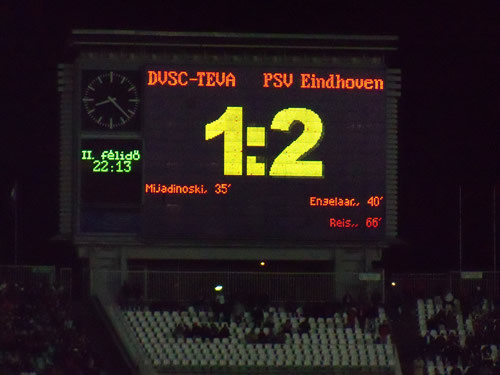 They couldn’t compete 5 minutes after the goal when Orlando Engelaar scored from distance to equalise for PSV. These Debrecen fans were still singing their guts out. After 45 minutes, 1-1. 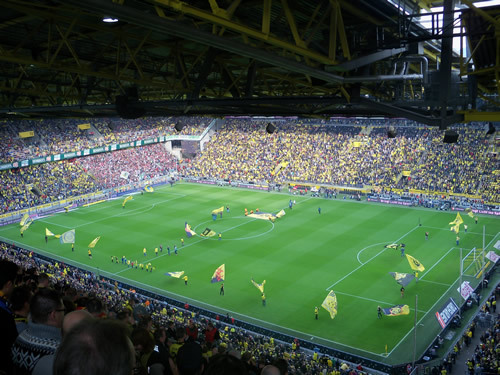 Normal games, at half time, we’d explore the ground & concession stands, but there weren’t any. So instead all we did was take photos off our scarves & us at the stadium. 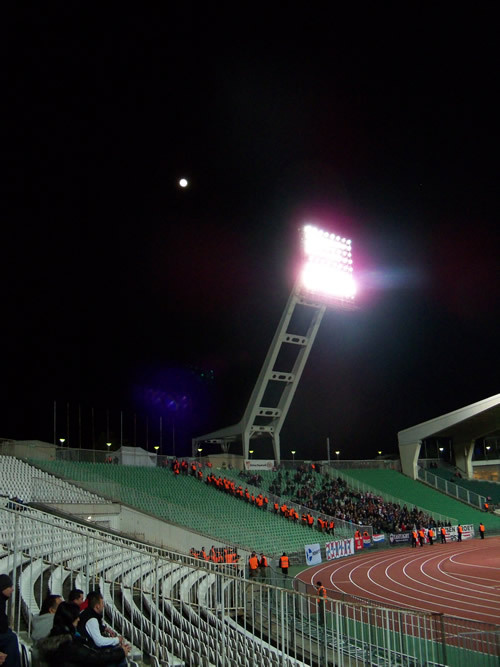 At Debrecen vs. PSV in a positively Baltic Thursday night in October – we were there. PSV attacked for large swathes of the second half. PSV kicked off the second half with a more attacking formation, and it paid off with more pressure, the second half was all PSV, and they duely scored with the Hungarian Balázs Dzsudzsák on the 70th minute. 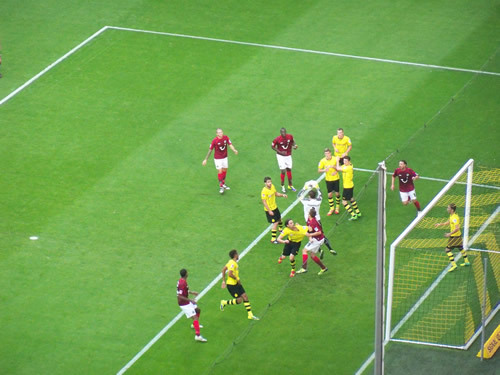 Following this, PSV became more defensive, but they had nothing to worry about. Debrecen fans were still in fantastic voice, singing the whole game and well into the final minutes. Bless the Eindhoven boys, but they couldn’t be heard. Following the final whistle, we returned to where the EFW Oktoberfest hotel – the Hotel Arena, to which I met fans from all over Europe (the best being a Royal Antwerp fan – we shared stories on Colwyn Bay‘s captain fantastic Damien Allen), before retiring back to my hostel for a good night sleep. Unfortunately, a monumental fuckup meant I couldn’t attend the rest of the weekend’s festivities, but I really enjoyed my second ever match abroad.